It’s no wonder Woody Allen used Polidor as one of the locations for his time-travel fantasy, Midnight in Paris. Stepping through the door is stepping back in time. 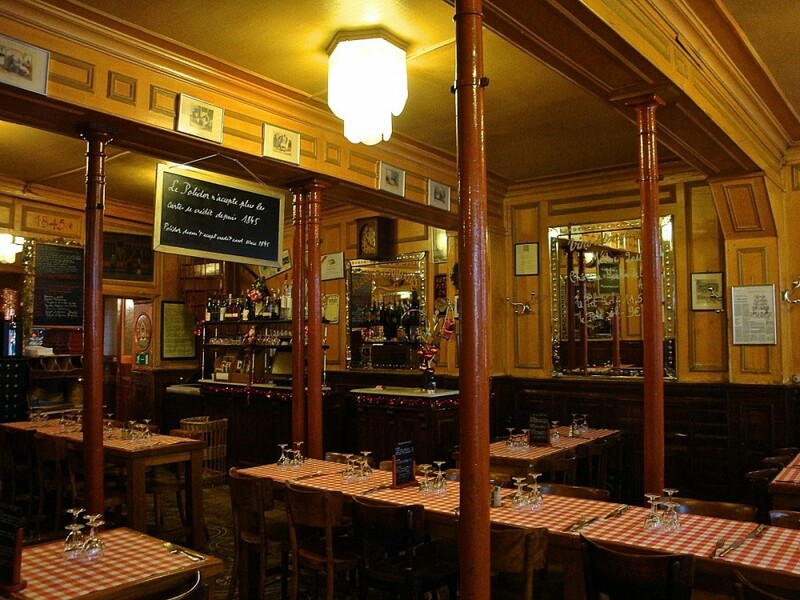 Founded in 1845 as a crémerie—its full name remains Crémerie Restaurant Polidor—selling dairy products and the occasional omelet, it had become a full-fledged restaurant by the end of the 19th century. Little has changed since then: a golden glow from glass-shaded lamps shines on burnished wood paneling, mirrored walls are scrawled with the wine of the month, a blackboard announces that the restaurant no longer accepts checks or credit cards “since 1845”, and the rows of little wooden boxes on the back wall once held the serviettes of regular clients. And an illustrious lot they were: Boris Vian, Jean Jaurès, Verlaine, Rimbaud, Hemingway, Joyce, Gide, Ernst, Valéry, all frequented Polidor for the simple, satisfying dishes it still offers today: pumpkin or lentil soup, confit de canard, pintade with cabbage, tarte Tatin. Service is brisk and no-nonsense, and you’ll be seated at long tables with other clients (great for solo diners), but the food is good, sometimes even excellent—a recent dinner included succulent, perfectly cooked coquilles Saint Jacques. And with prices starting at €4 for entrées (oeufs mayonnaise), €11 for main dishes (boeuf bourguignon), and €4 for desserts (baba au rhum), it’s as great a bargain for today’s traveler as it was for garret-dwellers of the past. And it’s open daily, for lunch and dinner, every day of the year. 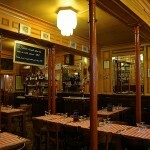 It’s certainly not inventive contemporary cuisine, but it’s a charming, almost magical, piece of Paris history. Prices are approximate, per person without wine.